Christmas is always a magical time, and it’s even more exciting when you have children who still believe in Father Christmas. From his jingling bells to his big round belly, and his team of reindeer to his promise of presents, Santa Claus is kids number one favorite man come Christmas! Bring Kriss Kringle to life in as many ways you can this Christmas, and reignite the magical spirit of one of the favorite months of the year. Let’s take a peek at how you can bring Santa into your home both home and abroad. At Journey Around The Globe we love making magical memories, and those that you can share with your children are all the more special. Take your children on a spellbinding trip across the globe to Santa’s workshop, and give them a true winter wonderland experience. If you want to see Father Christmas in the North Pole or in fact in his home in Finnish Lapland, then it’s time to take a winter holiday that will beat all others. In Lapland you’ll be greeted with a bewitching snowy landscape, reindeer sledding and cozy log cabins. All perfect for creating the true spirit of Christmas. In Finnish Lapland, your children will get to make snow sculptures, bake cookies and take snowmobile rides. They can even spend an afternoon searching and visiting Santa in his own home. Nothing beats meeting this magical man more than seeing him in action in his magical winter workshop. For the adults, there are roaring log fires, cross-country skiing and warm Finnish saunas. And for the kids? Copious amounts of snowy fun for an experience of a lifetime! They will be able to take husky rides, join in with Christmas crafts, visit the reindeer farm and eat their dinner in a restaurant made from ice. Take them across the globe this year for a white winter they will treasure forever. Christmas Eve is always such fun when you have children. As the suspense builds up, they’re barely able to contain their excitement. And they will want to stay up all night waiting for an appearance from Father Christmas. Luckily most will burn out by midnight, and you can get on with the Ho Ho Ho duty of bringing Father Christmas into your home. Be sure to make Christmas cookies with your children on Christmas Eve to leave out for Santa. Let them have fun decorating with glitter and sprinkles too. Make sure you also go shopping for carrots and milk too. Help them pen a letter to Father Christmas to leave out that night. And make sure you have one written by the man himself to leave in return for them. Get your children to make reindeer dust out of glitter and oats and tell them it’s to lure the reindeer into your home. Leave trodden snow footprints outside their bedroom doors and by the Christmas tree. Make these with flour, talcum powder or fake snow. Get some jingle bells and give them a little tinkle just as your children are falling asleep. And make sure to leave half eaten cookies and carrots for them to find in the morning. If you have a fireplace also leave a few coal marks so, they can be sure Santa has been. 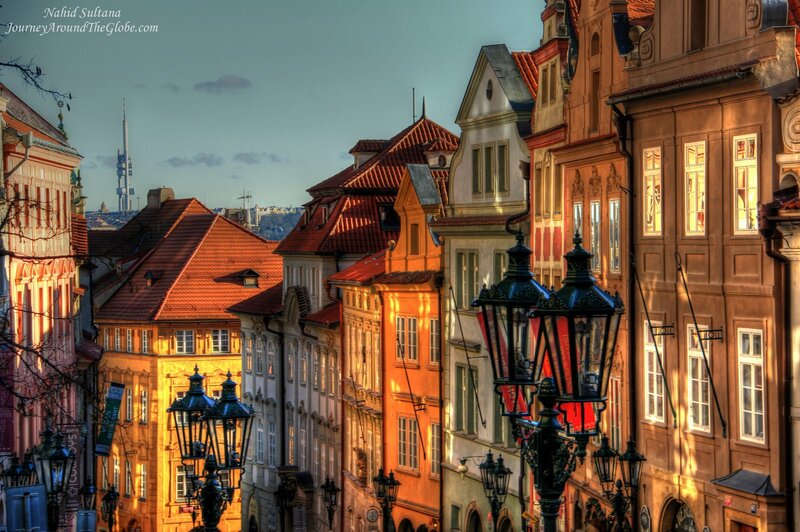 PRAGUE, CZECH REPUBLIC: Praha or Prague is a picturesque European city situated by River Vltava. 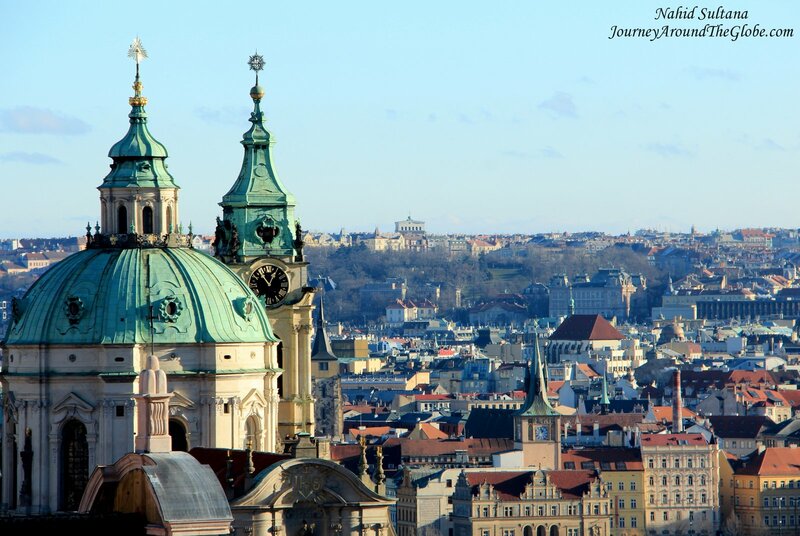 Founded in 9th century, historically, this was once the capital of the Bohemian region. Now it’s the capital and the largest city of Czech Republic. Prague is such a beautiful city that it would be unfair to try to describe it with words or portray thru photos. This is one of my favorite cities in the world where I can come back at any given every opportunity. River Vltava and its bridges are what you probably seen in lots of pictures from Prague. It is indeed something to admire. 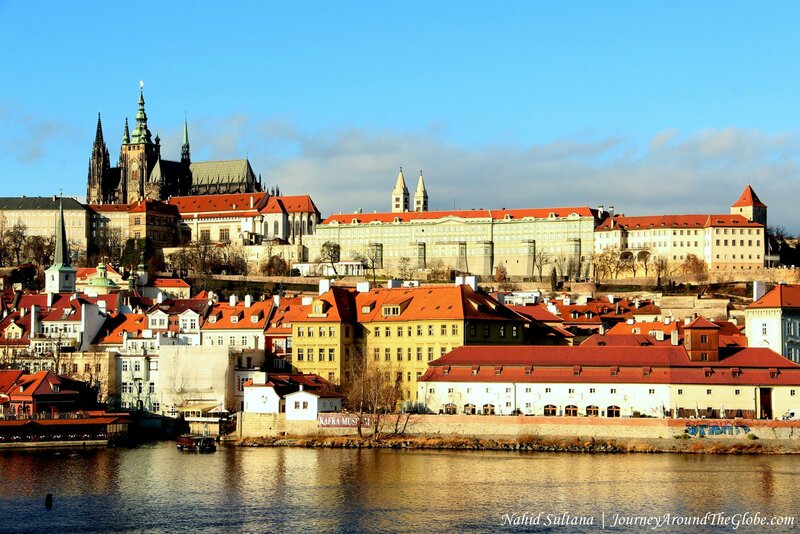 The city can offer some stunning views from many points like Charles Bridge, Prague Castle, and many of its towers. Prague is regarded as one of Europe’s most charming cities and is one of the most popular destinations in Eastern Europe. Its old town was listed as UNESCO World Heritage site in 1992. TIME of TRAVEL: I have mentioned in my last few posts that we took a road trip during Christmas of 2013. My uncle-in-law from Chicago was here with us during this trip. 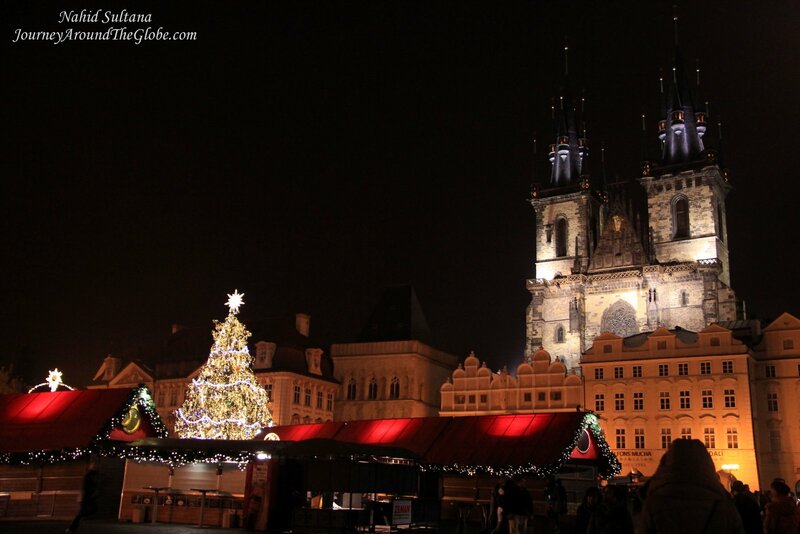 After visiting Fussen in Germany and Innsbruck and Salzburg in Austria we arrived in Prague the day after Christmas. Eastern Europe can be below freezing in December but it was actually not that bad during day. Temperature was definitely low at night but it didn’t stop anyone from having good time in Prague. Last time we were in Prague was during Easter holidays of 2009. We took a two weeks tour around Europe when we were still living in Portland, Oregon. Easter is very colorful here. 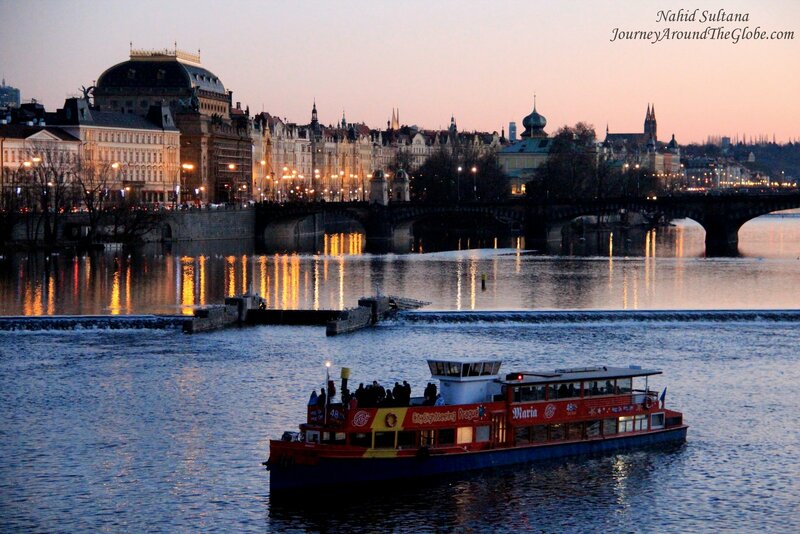 It doesn’t matter when you make a trip to Prague, it is always swamped with tourists and thriving with busy lives. OUR HOTEL: This time we stayed in an apartment-style place, Hotel Julis, in Wenceslas Square. Parking can be a problem (the garage is 5 minutes of walk) but the best part is you are right in the middle of a busy square. Christmas lighting was fantastic as well as the markets on the pedestrian zone. It took us only 5 minutes to reach the main square from here and maybe another few minutes to reach Charles Bridge. There were many shops and souvenir stores just outside our hotel. It was a spacious room with a small kitchen in one side. Breakfast and free Wi-Fi were included in the price too. Last time we were here in 2009 we also stayed very close to the old town. It was Hotel Unitas. It had breakfast and parking spaces for customers. If I can remember correctly, the hotel was only 5 minutes’ walk from the metro station. 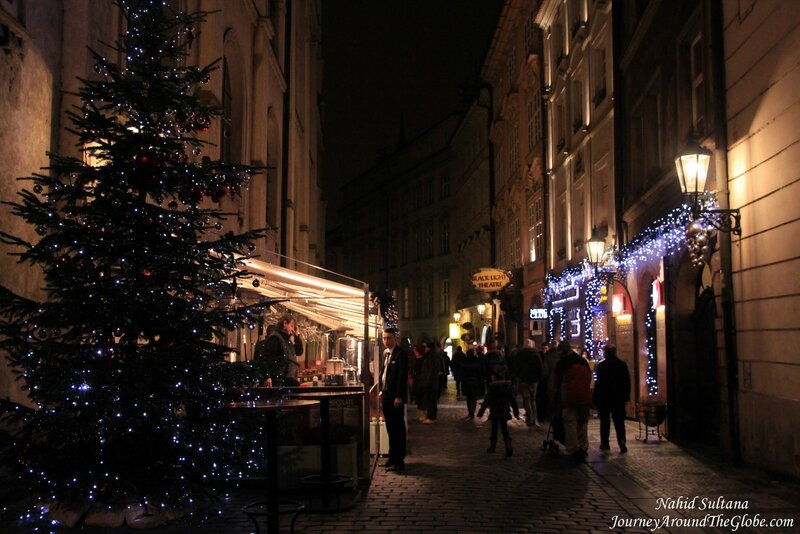 EATING and SHOPPING: Our first dinner in Prague was on the other side of Charles Bridge in Lesser Town. The name was “U Tri Zvonku” meaning “The Three Bells”. The food was fantastic, but the cool part of it was that there were small notes and writings on all the walls of this restaurant. Customers can write anything on its wall if they can find an empty spot. We also asked for some markers and our daughters wrote their messages on the walls too. Second night, we ate at “Taverna Toscana” near Astronomical Clock in the old town…good Italian food and nice people. 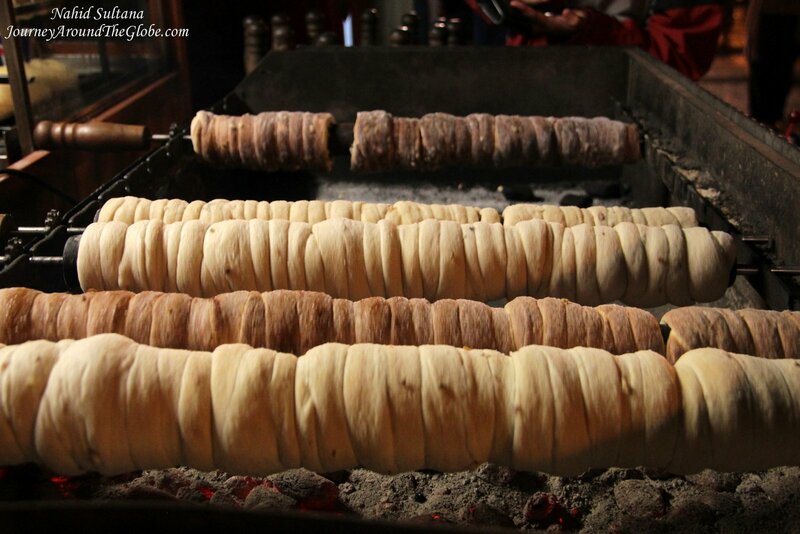 Afterwards, we tried a traditional Czech pastry-like snack, called Trdelnik from the Christmas market. It’s a rolled pastry roasted on fiery coals. Last time in 2009 we had dinner in old town square at the corner of Astronomical clock. And I remember clear they had some awesome dishes, especially the dipping sauce they served with the warm breads…still can’t forget its taste. There are too many things in Prague to buy as souvenirs or memorabilia. 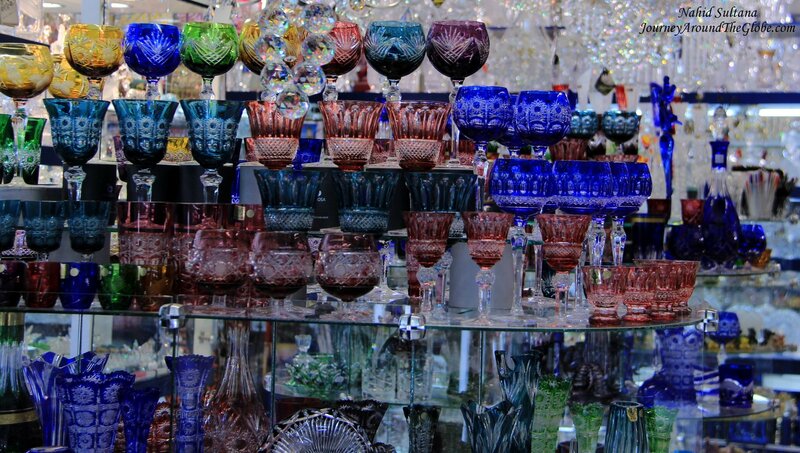 Traditionally, Bohemian glass or crystal are something very famous in this region. They are very exclusive and can be very expensive. Bohemian garnet is also very well-known in Prague. I saw many amber stores too. Also lots of stores carry wooden toys and marionette puppets depicting many celebrities and traditional characters from stories. Streets of Old Town and Lesser Town are packed with tons of stores. Shops in Old Town square during Easter and Christmas are good places to buy souvenirs for reasonable prices. Try to avoid buying things from the main old streets; you can find same items with much cheaper price in smaller alleys. We bought a print of sketch from Charles Bridge for 60 euros and a Bohemian glass vase with glass flowers from Wenceslas Square. In 2009, we bought a hand-crafted Bohemian crystal egg from Lesser Town for 20 euros, I think. PLACES WE’VE VISITED: First time we were here in 2009, we stayed in Prague for 3 days but this time we were there for a day and half. 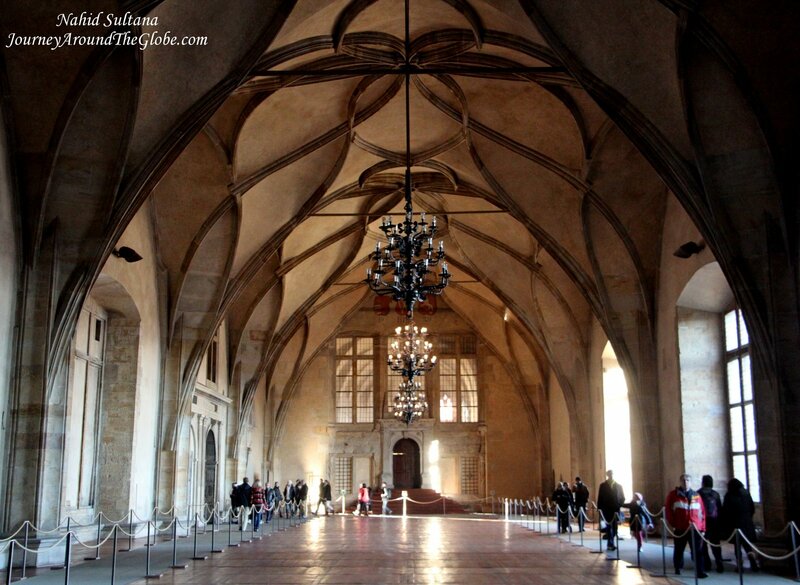 There are countless things to do in Prague which can keep any visitor busy for weeks. It is a big city after all and has something for every taste. Enjoy classic shows in theaters, be amazed by really old churches or synagogues, enjoy the view of whole city from different towers – like TV Tower or Petrin Tower, appreciate old and new architecture of Prague (especially check out the Jewish quarter for that), get lost in small alleys of old town, or if nothing just take a stroll on Charles Bridge and enjoy its bustling scenes. 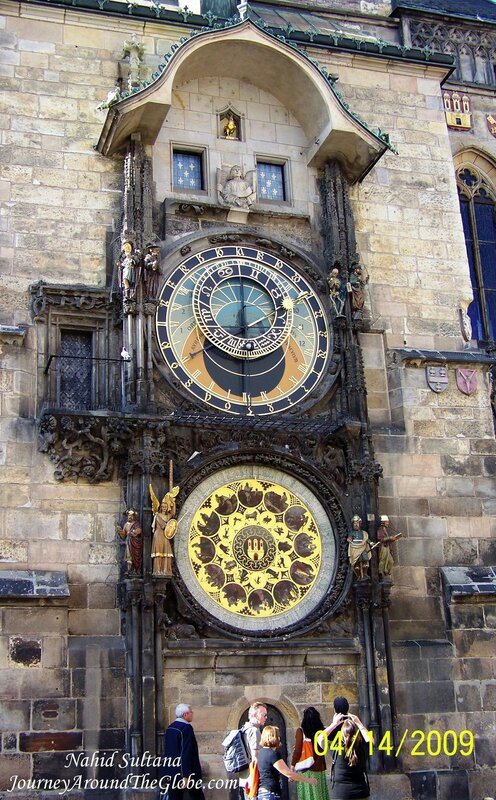 1) OLD TOWN and ASTRONOMICAL CLOCK: This is the main square and one of the liveliest places of Prague. The Christmas lighting and markets were fabulous here and the Christmas tree was one of the tallest and gorgeous I’ve seen so far. It includes several historic buildings, monuments, and churches. It’s a perfect place for drinks or a meal. Last time when we were here during Easter, the place had many stores at that time too. We took a horse ride around the old town from here. 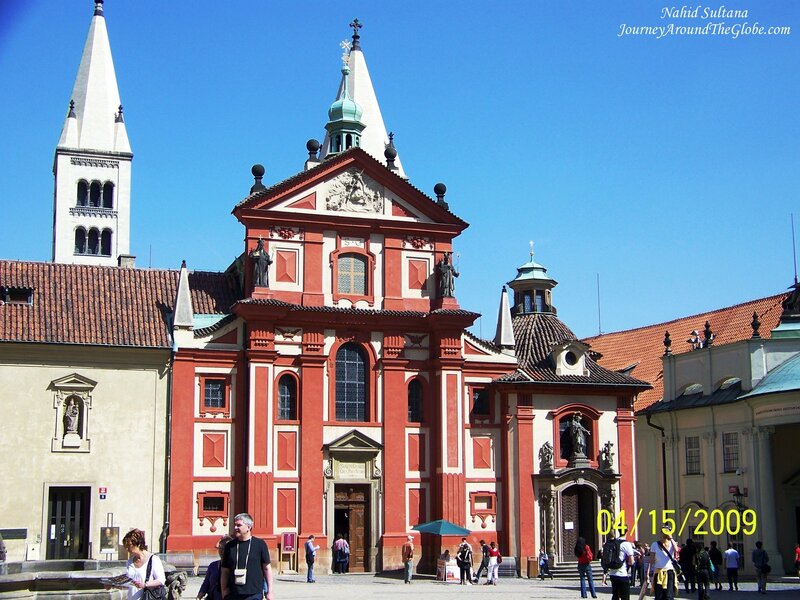 St. Nicholas Church is a Baroque church from 18th century in the northern side of the square. We never went inside the church but it’s beautiful. 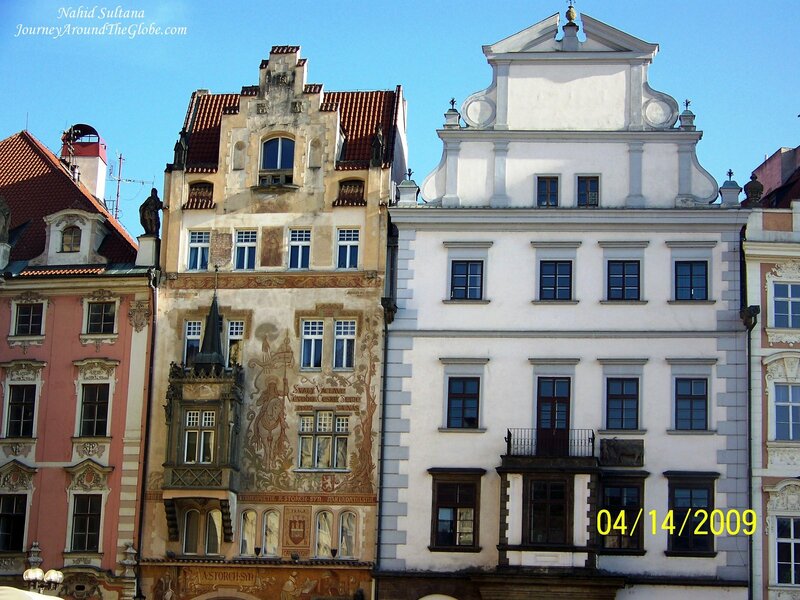 Goltz-Kinsky Palace (now National Gallery) from 18th century is the most remarkable building in old town. Church of Our Lady before Tyn is a dominating feature of this square. This 14th century Gothic church was the main place to worship in old town during that time. Currently, I am not sure if visitors are allowed to go in but it looks gorgeous at night when its two towers with 4 spires are lit up. The southern side of the square has a series of some photogenic Renaissance and Baroque façade buildings covered with murals from couple centuries ago. And finally, a huge memorial to a religious reformer, Jan Hus, stands in the middle of this square. At one side of the square is Prague’s old town hall with a big old astronomical clock on it. It’s a 14th century Gothic building. There is a little show at very hour when the clock rings…something worth seeing. Tourists are allowed to go inside and to its tower for a little fee. 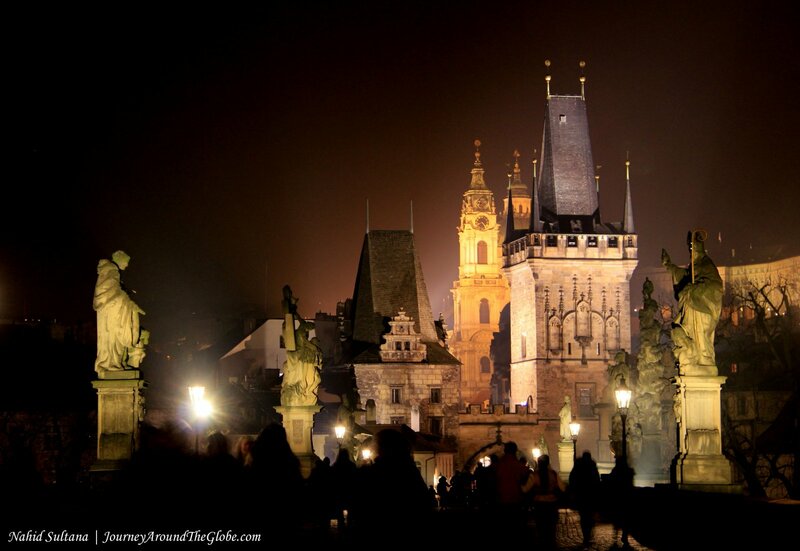 2) CHARLES BRIDGE (KARLUV MOST): This is my most favorite bridge in Europe and one of the must-sees of Prague. It connects Old Town with Lesser Town. It can be very crowded and touristy at any time of the year (particularly in summer days) but this pedestrian bridge over River Vltava offers absolutely stunning view of the river, other bridges, Prague Castle, and overall a nice view of a lovely town by River Vltava. This 12th century bridge has two impressive towers and I think, tourists can go on top on one of them. Thirty, mostly Baroque style, statues of various saints richly adorn the two sides of Charles Bridge (15 on each side). These sculptures are not the original ones (original statues were destroyed in floods and in other events) and you will see many people touching them for good luck. Take a stroll on this bridge both during day and at night to experience different looks of it. 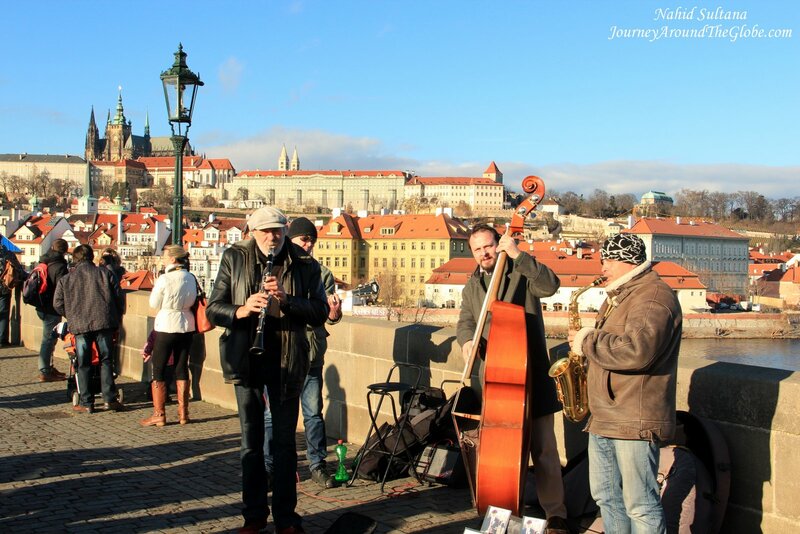 Charles Bridge is more than just a bridge, it is the symbol of Prague. The bridge is beautiful day or night. 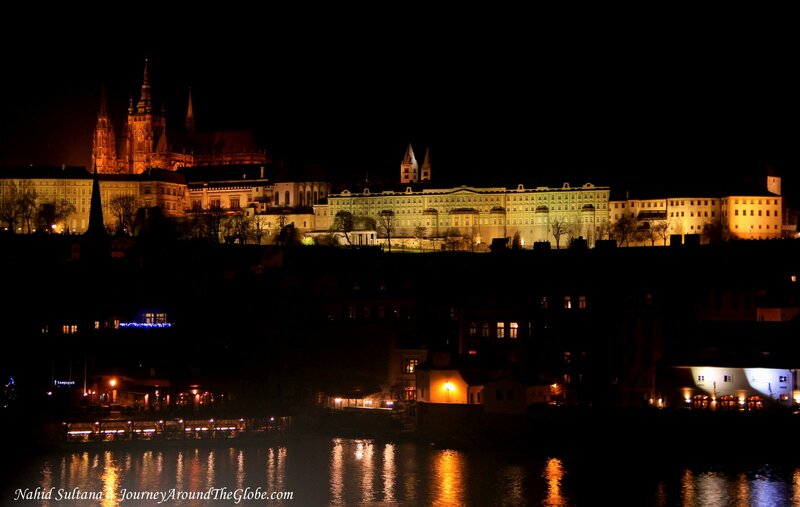 We crossed it once at night and then the next day to go to Prague Castle. By the way, this is a nice place to buy paintings or sketches done by local artists. You can also find some other local souvenirs on this bridge. 3) PRAGUE CASTLE: According to the Guinness Book of Records, Prague Castle is the biggest ancient castle in the world dating back to 9th century. You can find virtually every architectural style of the last millennium in this castle buildings. This is the place where Kings of Bohemia, Holy Roman Emperors and presidents of Czechoslovakia and the Czech Republic have had their offices. 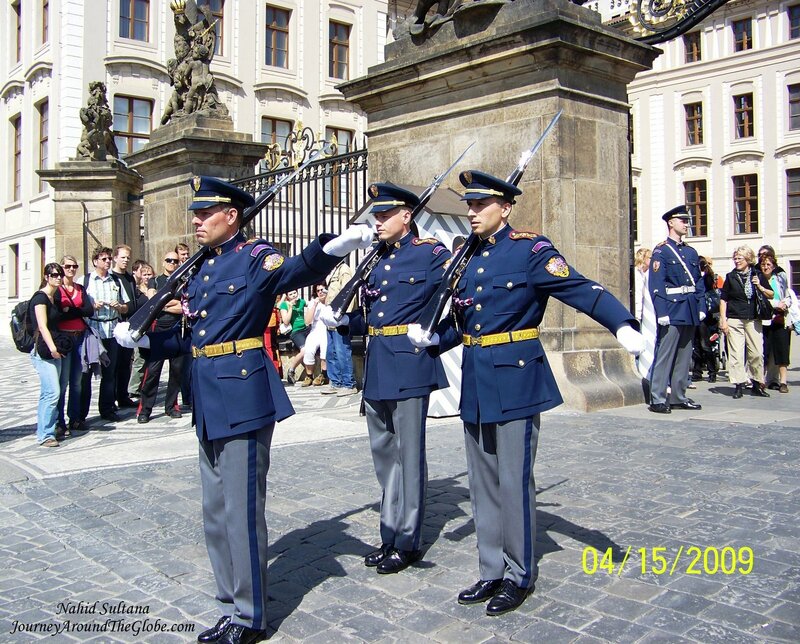 The Czech Crown Jewels are also kept here. Austro-Hungarian Empress Maria Theresa gave the castle its present architectural form. Ferdinand I (V) was the last crowned King of Bohemia and his coronation in 1836 was the last important event at Prague Castle before the creation of independent Czechoslovakia in 1918. You can get one of the best views of the city from Castle Hill. Bridges, steeples and domes of many churches, red roofs of nearby neighborhood, and everything in the far distance look fantastic from here. “The Gate of The Giants” is what the main entrance to the castle is called. Two royal guards stand there continuously. Make sure to be near the entrance to catch change of guards. It takes place every hour but if I think, at noon the event is longer and nicer. We saw it in 2009 but not this time.You can find several exhibitions, like art, history, toy museum, galleries, and few temporary or permanent exhibitions once you are inside the castle. Other than that the castle has several palaces, defense towers, and gardens. Most of the castle area is open to tourists. There are few big courtyards within the castle complex. As soon as we passed the first courtyard, we saw St. Vitus Cathedral. This Gothic cathedral is one of the most prominent architecture in the whole city. This is also the biggest and the most important church in Czech Republic. This grand edifice is stunning outside and very ornate inside. The pair of its old and tall steeples can be seen from far away. Although we didn’t go, anyone can visit its bell tower for a unique view of the city. Then we stopped at Old Royal Palace. It may not be that impressive from outside but the palace houses some old portraits, large halls, few old furniture, a throne room, and replica of orb, crown, and scepter. A red building beside Royal Palace is the Basilica of St. George. This Romanesque basilica was founded at the beginning of 10th century. It’s very simple and small. There was a small exhibition on church’s history here, maybe something worth visiting. From there we grabbed some sandwiches before walking towards the Golden Lane. This is something we didn’t explore in 2009. This is a small cobbled-stone alley with some exquisite shops. The main attraction of this lane is that there are some displays of Renaissance age’s professions and how those professionals lived during that time. You can see goldsmith’s workshop, an old tavern, a psychic’s house, and etc. Finally, we visited the prison room in the castle. It was a tiny underground cell from the medieval time. We get to see some old torture instruments and a big well where serious criminals were kept. The castle is located on the Castle Hill near Lesser Town. You can either walk up the ramp or take lots and lots of stairs to go up to Prague Castle. There are few packages to explore the castle. We took the “Short Visit” which was 250 CZK and it included St. Vitus Cathedral, Royal Palace, St. George’s Basilica, and Golden Lane. Kids under 6 enter free. 4) LESSER TOWN: The neighborhood on the other side of Charles Bridge near Prague Castle is known as Lesser Town. This is also an old part of Prague. This historic quarter has some beautiful cobbled streets, churches, and local shops. 5) MARRIONETTE OPERA: Something new we did this time in Prague was that we watched a marionette opera show in old town of Prague. 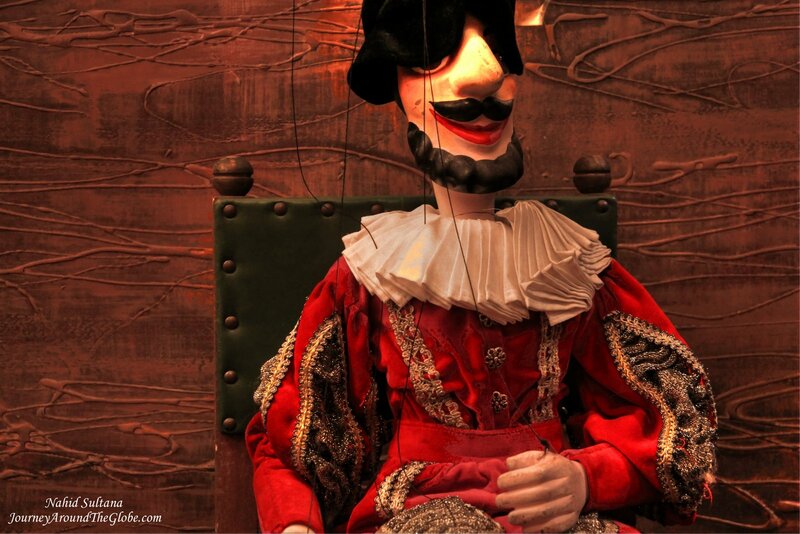 This side of Europe (including Austria) is very famous for their marionettes. The one we saw was called “Don Giovanni”. This was a gift from the famous composer Mozart to the city of Prague in 18th century. It’s a classic story with fantastic music and wonderful puppets. We went there mainly for the kids but I even loved it so much (although we couldn’t understand story) that I had to come back to hotel and read the story of Don Giovanni…should have done it before going to the performance. The theater is very close to Charles Bridge, can’t really remember the name. They have marionette shows like this every day at 5pm and 8pm and the show lasts for about 1 hour and 15 minutes. 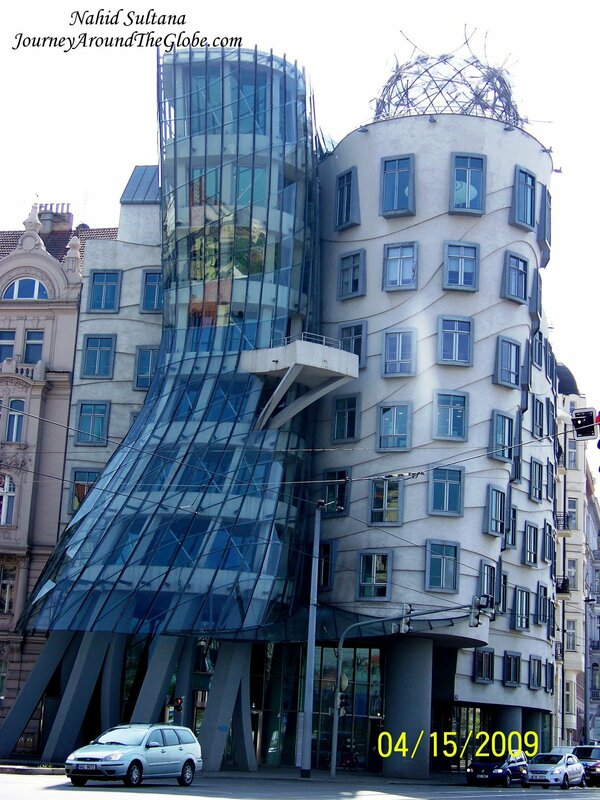 6) DANCING HOUSE: Also known as “Fred and Ginger”, this is one of the unusual buildings in Prague which was built in 1996. It was named after two dancers, Fred and Ginger. This is Canadian-American architect Frank Gehry’s one of the finest piece of works. You may have to walk a bit away from the old town but it is within walking distance and something worth the visit. 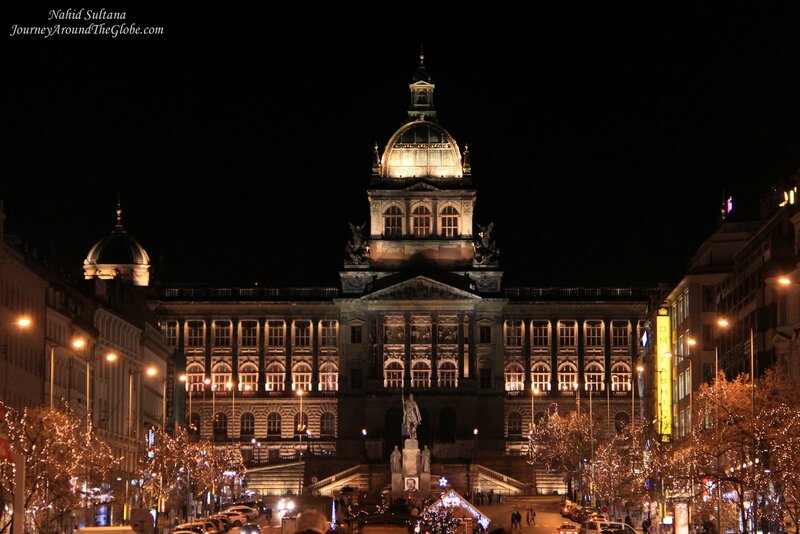 7) WENCESLAS SQUARE: Although this is the biggest square in Prague, it is more than just a typical square. Originally it was a horse market in the Middle age. Now, Wenceslas Square is more like a modern avenue lined up with many shops and souvenir stores…a fantastic place for shopping. The place comes alive especially after dark. We found a big Christmas market here too. A statue of St. Wenceslas was placed here in the 19th century. This is a historic place of the Czech people, this is where they came together to demonstrate against the communist government. At one end is the Czech National Museum.